Just heard from a friend living north of Pittsburgh, Pennsylvania. Monarch Mama, nearly 4 hours north, in western New York state, reports that she has seen a healthy number of Monarchs today, seeking nectar-pumping flowers in local Jamestown, New York area meadows and flowerbeds. That report from a seasoned Monarch expert is Sweet News for us. Desperation, the result of shared experiences: He says he’s seen 2 so far this year / She replies that she’s only seen 3, has enabled an apathy to settle in for some. 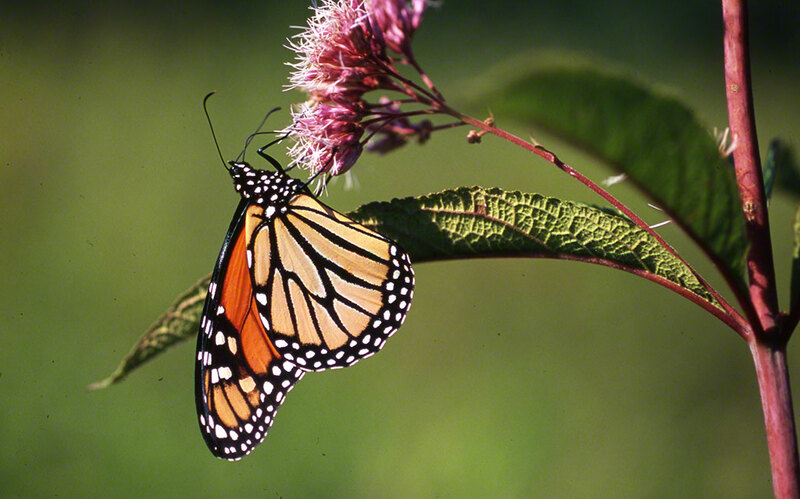 Now this credible report, jars our memories, for in late summer 2015, we finally saw some Monarchs in the northeast. Those Danaus plexippus were surfing the warm air currents down from Canada, and perhaps very northern New York, New Hampshire and Vermont? You drag your bones out of bed, get ready for your debut in the outside world, grab your cup of coffee . . . and just out your door, you do the Happy! and take a sustained look at your beautiful garden . . . and OMG! a Monarch. A Monarch!! That’s a preferred way to begin your day! No? Stay tuned. I’m more than half way through Benjamin Franklin, An American Life by Walter Isaacson (Simon & Schuster, 2003). I’m enjoying it alot, and PS 244 in Brooklyn taught us little to nothing about this period in our history. The English royalty is always in the background, playing a silent but critical role in the disfunction that existed between the Colonies and England. I’m now on page 301, with the great majority of the colonists through and done with the King and Crown. Franklin loved the Crown, but came to realize the our place in the British Empire was cooked, done, over. 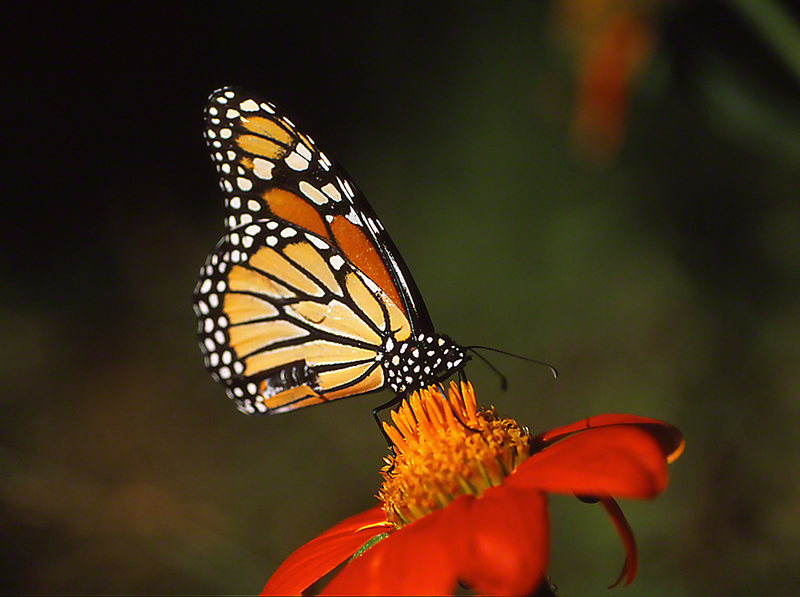 Now, Americans retain a great Love for this Monarch, (Danaus Plexippus). wingedbeauty.com has posted many images of Monarch butterflies, yet personally, I do not get bored seeing a good one. We suffered a real scare these last years, with doomsayers forecasting the flight of the very last East Coast U.S. Danaus Plexippus. Now that we are hearing that the flight of the East Coast and Mid-Western Monarchs is substantial, we can relax at least this one tension in our lives. This one (gender?) is fresh, and that forewing flash of burnt orange bedazzles. In this photograph, we’re at the Outdoor Gardens of the Phipps Conservatory, in the center of my home city, Pittsburgh, Pennsylvania. N.B., The 122 scans are back from Rewind Memories, and very soon we will be sharing our images from New York, Pennsylvania, Georgia and Florida. Yippee! You Bet!